I gave up doing monthly wrap-up posts some time ago but I'm going to return to them I think. The reason being that I'm not reviewing every book I read these days and a monthly wrap-up post is a way of just mentioning those I haven't reviewed. Otherwise they tend to sink without trace, and that's a shame. Favourite book of the month? Probably City of Pearl by Karen Traviss. But then I do love a traditional sci fi novel. My final read of the month was The Winter Garden Mystery by Carola Dunn. This is book two in the author's Daisy Dalrymple crime series, set in the early 1920s. Another delightful installment which sees Daisy off on another of her jaunts to a stately home to write an article for her magazine. Whilst exploring the house's Winter garden she is instrumental in the discovery of a body, buried under an azelea. It seems it's the body of a parlourmaid, Grace, who, it was thought, had run off with a salesman for a corset company. Obviously she didn't and Daisy's friend from the first book, Chief Inspector Fletcher of Scotland Yard, is brought in to investigate with Daisy variously helping and getting under his feet. This was again an utterly delightful read... great fun, pacey, and Daisy is her usual irrepressible self. So pleased I have another six to read and already thinking about where to get the rest. To finish up this post, a quick 'recent acquisitions' section. This is what I bought in Cardiff last week. Wagner the Werewolf by George W.M. Reynolds is classic horror but not a book I know a lot about so I nabbed it and will probably save it for Carl's RIP challenge later in the year. That one was purchased in Waterstones in Cardiff. I checked out a few charity shops and a bookstall in the market as well but didn't find anything of interest. As I mentioned before I'm currently reading Thrush Green for my 'book at bedtime' and am also about to start The Forbidden Tower by Marion Zimmer Bradley for Carl's Sc Fi experience. I'm not sure what the matter is with me at the moment. Other than a slight cold I mean... *g* I've started no less than three crime books - all good books - but none of them caught my interest and all and ended up being either sent back to the library or back on the library pile for when I get back from Cardiff (off on a short break this week). Although, it didn't help that The Surgeon by Tess Gerritson was missing 2 pages right at the start! I just can't seem to settle to anything serious, which concerns me a bit but I'm hoping it will pass. It could be that I'm going through a reading slump and can only cope with easy reading at the moment. What I do seem to be devouring with no trouble whatsoever is Miss Read books. 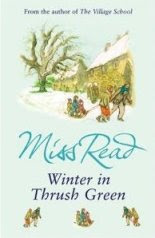 I've just started my third one this month, Storm in the Village, which is a Fairacre book, but the other two were Thrush Green novels - my first in that series. 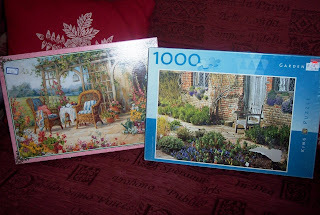 The odd thing is that much as I love her Fairacre books, I think I like the Thrush Green ones even more. I think it may be to do with the characters in these very gentle 'English' books: there are more of them, they recur in a more organised fashion and they seem more rounded to me. Or is it the Cotswolds setting which is more familiar to me than Sussex? Whatever, I'm loving them and on the lookout for more from the library. The combination of Stephen's memories and thoughts on all kinds of subjects was the perfect mix for me. The book stayed with me for weeks after I'd finished it and nothing else I read last year did that by a long chalk. 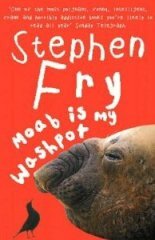 I have his second autobiographical book, The Fry Chronicles, on my tbr pile and will probably ear-mark that for summer reading. Strictly speaking I did actually enjoy most of what I read last year, but fiction-wise very little stood out hugely. 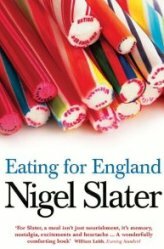 The fact that the best books for me were non-fiction and that I've thoroughly enjoyed the one non-fiction I've read this year, Eating for England by Nigel Slater, is making me rethink my whole attitude to what I read somehow. I'm wondering if I was just lucky and the ones I picked up just happened to be suited to my tastes, or whether I would enjoy a lot more non-fiction if only I would give it a chance. Food for thought. I haven't read any real science fiction in ages. I can't say for why... I got hooked on various Fantasy series I think - that probably began with Harry Potter - which is a genre I always used to think was not for me. Of course it was, I just had to find the right books, which I did, and promptly ran off and abandonded science fiction. I thought I might try to put that right this year and Carl's Sci Fi Experience is an ideal starting point. My first book for this casual challenge is City of Pearl by Karen Traviss. Shan Frankland is an Environmental Hazard Enforcement police officer. Within a month she's taking early retirement and can't wait. Then a call comes from higher up and Shan is suddenly offered the chance to lead a mission to Cavanagh's star. If she agrees, 150 years will have elapsed by the time she gets back, Shan having aged only a few years. She is not at all keen to go unless they have a good reason for choosing her but they won't say what that is. Under a Suppressed Briefing they tell her, but this information is only available to her on the mission - when it's needed. In the meantime it sits in her subconscious. Shan realises something must have persuaded her and agress to the mission. The planet has been settled by a small group of Christian settlers but when they arrive Shan and her group, comprising scientists and marines, find that things are not that simple. An alien lives among the colonists, an individual Shan finds strangely compelling. Aras is Wess'har, from the planet's twin world, and it appears that he is the protector of the entire planet. The planet itself has an indigenous species but they reside in the oceans. Another race from elsewhere is interested in the planet and Shan and her group find themselves smack in the middle of a very complicated, hostile situation. It's further confused by Shan's growing fascination with Aras. He has a secret. What is it? And will the consequences of this secret bring her fellow humans from Earth to pillage for all they are worth? And if it does, whose side will she choose to be on? Karen Traviss is an author better known for her Star Wars novels, I gather. I've not read any of those so have no idea of their calibre but judging by City of Pearl I would think they are quite good. I have to say I was very impressed by this novel. Sometimes you find with sci fi that the idea is good but the writing style fails to impress; actually that could be said of all books I suppose but I find it especially so with this genre. Anyway, not so in this case. The writing is excellent and the execution of what is quite a complicated, twisted plot is really very competent. Shan herself is an excellent main character. The author has made her a strong woman but with a conscience - someone who constantly strives to do the right thing even when circumstances dictate otherwise. She is, quite frankly, torn between blind allegiance to her human roots and the increasing pull of a very alien way of life. The story is told not only from her point of view but also that of Aras, the Wess'har, and thus the reader is also torn - forced to face the reality of the destructiveness of the human race. This is very much an ecologically thought-provoking book and one that makes you ponder on the nature of sentience. To be honest I think this book could be one of favourite reads of the year. Be warned, it is part one of a series and part two is out of print and quite hard to get hold of (the rest of the series is not) unless you have a Kindle, which I don't... not at the moment anyway. I certainly plan to read the rest though, and would highly recommend it to Sci Fi fans who like first contact or colonising type stories with a complicated, pacey plot. This was my first book for Carl's Sci Fi Experience. It's also my first book for my What's in a Name challenge which is being hosted by Beth Fish Reads and covers the category for 'jewellry or a gem' in the title. My current read - City of Pearl by Karen Traviss - is going a bit slowly, not because it's a bad book, it's actually rather good, but because I'm taking my time and savouring it. So as it makes me seem quiet (not a natural state for me I can assure you) I thought I'd do a Library Loot post to fill the void. Well... I made a sort of new year's bookish resolution to only check only 3 to 5 books out of the library. I did actually keep to that but conveniently forgot I already had 2 books left on the shelf at home. I think I must be a dyed in the wool Lost Cause. Officially hopeless. The Lost Art of Gratitude - Alexander McCall Smith. Book 5 or 6 of his Isabel Dalhousie series and my idea of a good comfort read. The Likeness - Tana French. Her sequel to In the Woods which I read ages ago and have been meaning to read the sequel for ages too. Very happy to see this one sitting on the library shelf. Where Late the Sweet Birds Sang - Kate Wilhelm. A randon grab, classic sci fi, which I may or may not read for Carl's Sci Fi Experience. Red Bones - Anne Cleeves. Book 3 of her brilliant Jimmy Perez series. The Surgeon - Tess Gerritsen. A series recommended to me by all and sundry and my eldest daughter. Been waiting quite a few weeks for my library to get this back in. And the first book I'll read off this pile when I've finished my current book? Most likely The Likeness by Tana French as I know it will be *really* good. I've finished my first book for 2011 and it's... non-fiction! Sometimes I surprise even myself. LOL. In fact, this first book is for one of my challenges, The Foodie's Reading Challenge which is being hosted by Margot at Joyfully Retired. And the book is Eating for England by Nigel Slater. 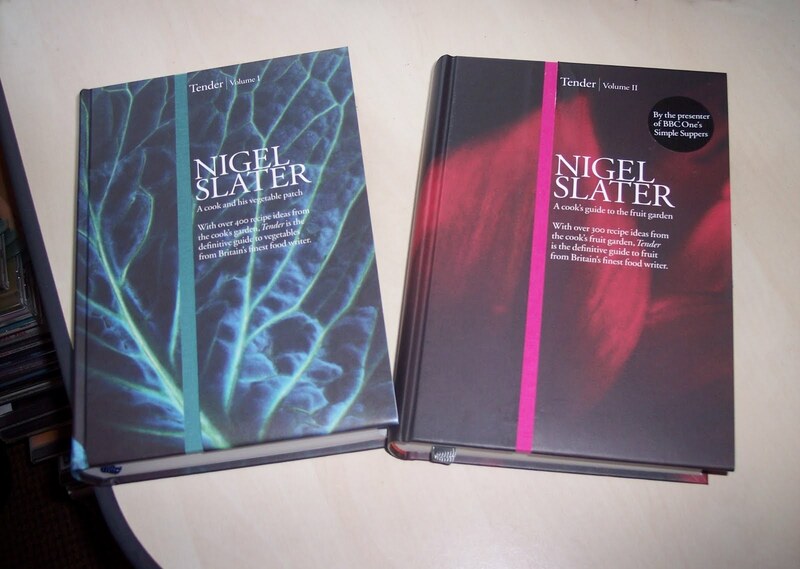 First of all I have to confess to being a huge fan of Nigel Slater's. Anyway, Nigel Slater has a number of cookbooks available in bookshops but he also has an autobiography, Toast, a really excellent read which was dramatised by the BBC this Christmas, and Eating for England. The British have a curiosly broad culinary identity. Only the naive would now try to pin us down as a meat-and-two-veg culture. You could argue that ours is a rich and multiculturally exciting cuisine reflecting a country of diverse tastes and open minds; but equally it sometimes looks as if we are in a state of total culinary shambles. Pretty accurate I would say, and Eating for England is a book that illustrates that fact. Mostly, it's a nostalgic look back at the kind of things us Brits ate when we were younger. He's around the same age as me so much of this nostalgia resonated with me very strongly. He discusses at great length the biscuits we ate then and sometimes still eat; the sweets and chocolate, some of which are still with us, some not; the puddings which were normal fare but which now tend to be cooked by posh restaurants (some of us still make them!). But also he's a great advocate for shopping at Farmer's Markets and local butchers rather than the supermarket. Which is fine if you have these available to you but not everyone does. I find the Farmer's Market to be expensive to be honest and where meat is concerned I shop both in the local butcher and the supermarket. Eating for England is simply a personal celebration of the food this nation cherishes, the rituals we observe, the curious and even eccentric thing that is the British and their food. My husband said, 'Not more cookbooks!' as I drooled over the beauty of these books. They are truly a work of art... about as seductive as the man himself. I haven't done a wrap-up post for what I read in 2010... mostly because I'm trying to be a bit more casual about my reading and not put pressure on myself to achieve a certain number of books read. Nor am I doing a plan for 2011. Same reason really although I do have a few vagues ideas, one of which is to try to get my tbr pile down a fair bit and maybe not borrow so many books from the library. I will still go of course, but, instead of bringing back 9 or 10, I need to restrict myself to 3 -5 books which I actually *read* rather than take most of them back unread. I could also say that I want to read more Victorian lit, non-fiction (I did actually do better with that this year - 9 rather than 1), especially biographies, food books and travel books, and crack on with some of the series I have on the go. But I say all of that every year and I just end up reading what I fancy... so I'm not going to say it and just enjoy what I read instead and not stress about whether it's in the plan or not. What I foresee is a lot of crime stories devoured because that is clearly my new 'thing' and certain blogs - you know who you are - are very sneaky about pimping new authors and I simply can't resist. And whatever comes inbetween the crime books, well so be it, I enjoyed most of what I read last year and that, after all, is the aim is it not? Or should be. I saw this 'My life in Books' meme over on GeraniunCat's blog so thought I'd give it a go. I thought, with a choice of 60 books - which is my book total for last year - that it would be easy. 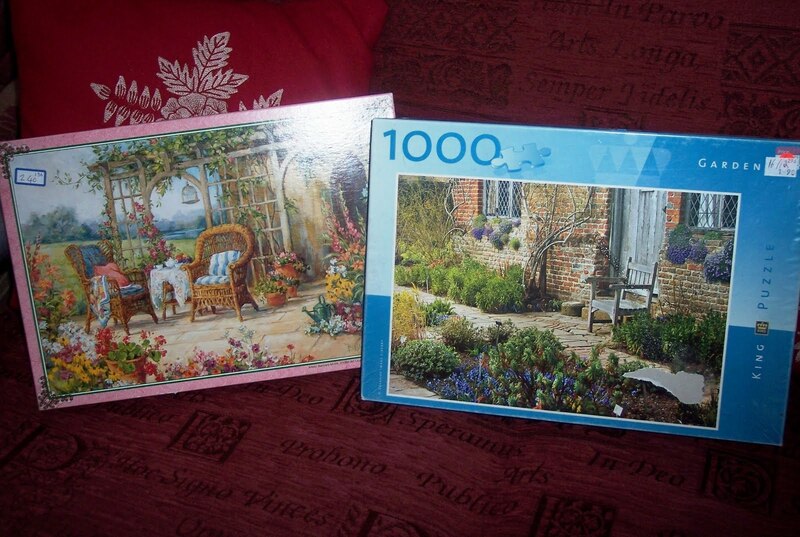 Then I remembered doing something similar the year before and that it was quite tricky... and so it turned out to be. But - great fun. "Using only books you have read this year (2010), cleverly answer these questions. Try not to repeat a book title. It's much, much harder than you think!" As a teen (1960s) I was a rare specimen indeed. Why? Well, I was a girl who read science fiction. I wasn't aware of being different until my English teacher informed the whole class of the fact. I'd written a sci fi imaginative story and Mr. Owen was tickled pink, read it out and told everyone he'd never come across a girl who read - and wrote - science fiction before. Suddenly, from being a quiet 'swotty' girl who wasn't much noticed I became a girl the English teachers took an interest in. It was *extremely* weird. As I devoured H.G. Wells and then moved on to any modern sci fi author I could find in the library, usually in a yellow 'Gollanz' cover, the teachers became more fascinated in my book reviews and my mother and grandmother started to worry. I always had my nose in a book apparently, shouldn't I be going to dances and chasing boys? Phttt! No thanks... The books were *much* more interesting! (I did eventually find myself a boyfriend... aged 19, in my first job in a bank, he was a sci fi reader too funnily enough and yes, gentle reader, I married him. I would have been stupid not to as he too was a rare specimen. Mum stopped worrying then. Well I think she did...) And then, aged around 16, Star Trek happened. I think I died and went to heaven when I set eyes on Mr. Spock... my science fiction future was assured and I remain an avid Trek fan to this day: series, movies, the whole bangshoot. My fascination with the stars and other planets never went away. I'm not sure why, maybe sci fi fans are born... at age 4 I remember doing one of my brother's jigsaw puzzles - a moon scene with men walking around in space suits. He wasn't remotely interested but the subject absolutely rivetted me and my first ever picture I drew at school... aliens. I'm convinced I must have been born that way. Now, all that rambling (sorry) is to admit that I am a lapsed sci fi fan. I really do not read enough of it these days and it's a sad thing. So what I'm going to do to remedy that is to take part in Carl's Sci Fi experience this year. 1. To spend the winter months (my favorite time of year to read science fiction) sharing my love of science fiction with others who love the genre as well. 2. To gently encourage those who have either never read science fiction, only rarely read science fiction, or have read science fiction and had a bad experience to give it a chance. Unlike the challenges I host other times during the year, there are no specific number of books to shoot for. This is simply an opportunity to get together as a community and share a love of science fiction…and to hopefully spark a love of science fiction in those who have yet to be bit by the sci fi love bug! 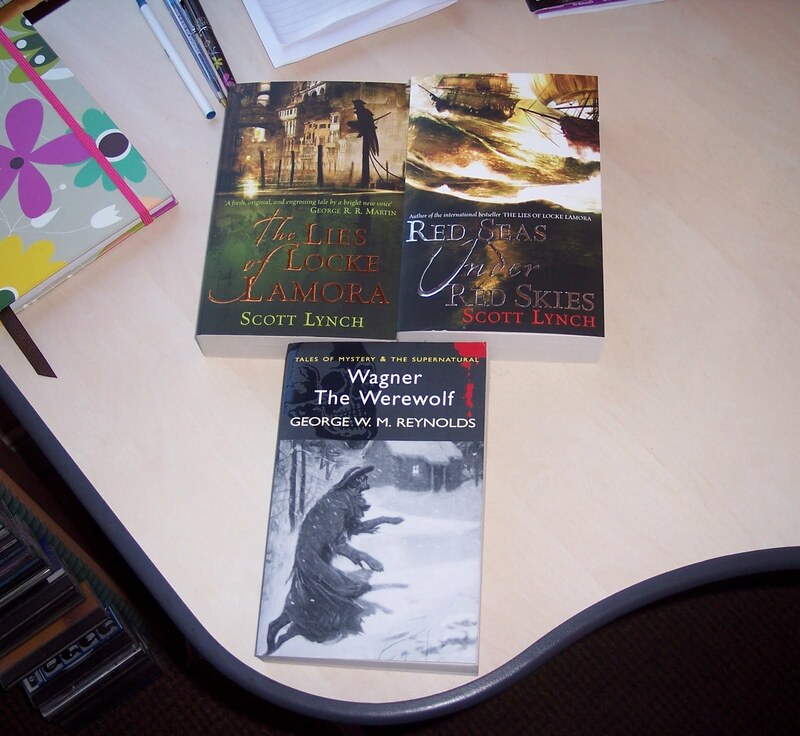 Honestly... if I read those three I would be very happy bunny indeed! Watch this space (groan - sorry). I've been too busy to blog much over the past week, and I'm also very behind in reading my favourite blogs and commenting, so I must apologise for that. I will catch up eventually. In the meantime Happy New Year to all who pop in and read and or comment. I really do appreciate the friendships I've made via this bookblog of mine, not just that but the book recs and the opinions, whether they agree with mine or differ. All are welcome! 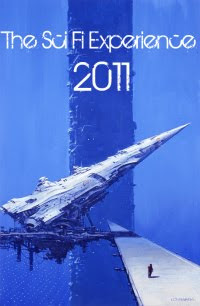 I hope 2011 is a good year for you in every respect. 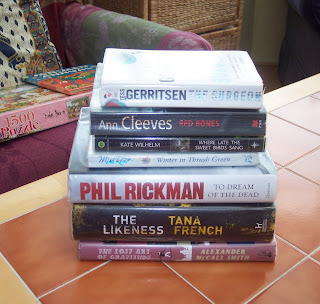 As always, I didn't have heaps of time to read over the Christmas holidays and I knew this would happen so I kept the books I did read fun and easy to read. I'll just talk about them briefly and that'll wrap up my books for 2010. 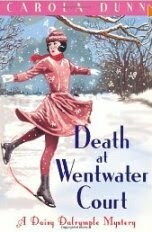 First up, Death at Wentwater Court by Carola Dunn. It is the late 1920s and Daisy Dalrymple is a journalist. She is in fact a society girl from a wealthy background, but circumstances have forced her to earn her own living so she has taken a job with magazine. Her latest assignment is to write articles on the stately homes of England - which is how she comes to find herself at Wentworth Court just after Christmas. With snow on the ground and comfortable in the company of the great and the good, this should be an idyllic assignment. But one Lord Stephen Astwick is present at the house party and Daisy senses that all is not well. He seems to have a history with many of the other guests, some of whom seem to actually fear him. 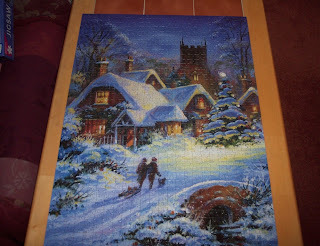 When his dead body is discovered, early one morning, on the frozen lake it's assumed he's had a fatal skating accident but Daisy's photos, taken of the crime scene, would seem to suggest otherwise. Chief Inspector Alec Fletcher arrives to investigate and Daisy finds it a pleasure, in more ways than one, to help him with his investigations. This is the first book in a series that has now reached about eighteen in number I believe. I now own the first eight and I'm pleased about that as I enjoyed this one immensely. Daisy is intensely likeable as a main character, great fun but also with a strong streak of common sense and clear headed in an emergency. The plot itself is a typical country house mystery, along the lines of Agatha Christie, so you know exactly what you're getting, or hope to get, and the author doesn't disappoint. I didn't work out who'd done the deed, so finding out who and why was a surprise. All in all, a good start to the series and I'm looking forward to reading more. 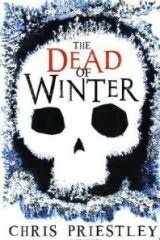 Next, The Dead of Winter by Chris Priestley. Michael Vyner has recently lost his mother, his father having died a few years ago in Afghanistan (in the 1800s), saving the life of Sir Stephen Clarendon. Thus, he is now an orphan. Sir Stephen has offered to take him in and Michael goes to stay with him at Chrstmas to see whether they suit. The house is in the middle of a marsh in East Anglia. Travelling there and nearing the house, Michael sees the apparition of a woman and it is clearly connected to the house, Hawton Mere. Arriving, the boy finds his new guardian is almost insane and the rest of the household also very odd. The house, dark and lonely, is clearly harbouring secrets. How did Sir Stephen's wife die? And who is the ghostly woman Michael sees again and again? Michael knows somehow that it's his task to find the answer to these questions. Yet another excellent book from Chris Priestley. His 'Tales of Terror' series of three is excellent and so is this stand alone novel which is very much in the vein of The Woman in Black by Susan Hill or Willkie Collins' books... but for young adults. The story is seriously creepy, very atmospheric and beautifully written. 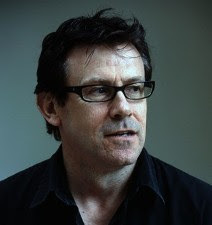 I don't know why Chris Priestley is not more well known as, in my opinion, he is a class act in the genre of YA horror. Just exactly what I need... another addiction.